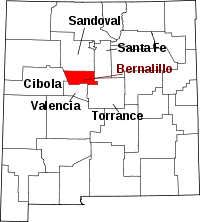 Bernalillo County is home to the major town of Albuquerque, the county seat, and also the largest city in New Mexico. Bernalillo is also the most populated county in the state, by far, with over 660,000 residents, almost as many as the rest of the state combined. The County Clerk's office is responsible for maintaining all public records for the county and is located at One Civic Plaza NW on the 6th Floor in Albuquerque, NM. Among the record types available at the office are marriage records, real estate and deeds, judgments, and more, and the office has a complete staff on hand to help find any specific records. Divorce records on file with the Bernalillo County District Court, and birth and death records are available from the New Mexico Department of Health. The latter two only become available to the public upon reaching 100 years of age.